Making really BIG stars: Embryos of Supermassive Black holes? 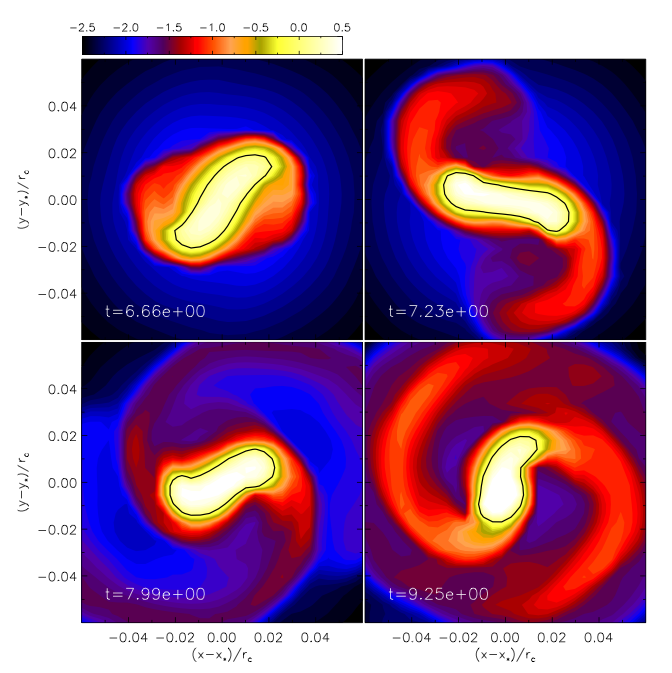 • Title: Rapidly Accreting Supergiant Protostars: Embryos of Supermassive Black Holes? Supermassive black holes (SMBHs) are littered throughout the universe. Observations suggest that many SMBHs have masses exceeding a billion solar masses only 1 Gyr after the Big Bang. But what are the “seeds” of these SMBHs and how did they get so big so quickly? One possibility, which the authors explore in this paper, is that the SMBH progenitor may be the black hole left behind by a supermassive star (SMS). However, in order to explain the high masses of SMBHs when the universe was relatively young requires that the initial masses of these stars must be relatively large – about 100,000 times more massive than the Sun. A star this big will be unstable, thanks to General Relativity, and will collapse to form a ~100 solar mass black hole. A black hole this massive can attain a mass of ~1 billion solar masses when the universe is about 1 Gyr old by accreting surrounding material at a very high rate. A SMS can form in a sufficiently massive dark matter halo which favors collapse with little to no fragmentation. This is because the primary cooling (i.e., energy release) mechanism for the collapsing gas is via neutral hydrogen. This collapse will lead to accretion rates of the order of 0.1-1 solar masses per year, much higher than those expected for Population III stars (i.e., the first stars). A potential problem exists in this scenario. Massive stars are very hot, so they emit copious ultraviolet radiation that can ionize nearby gas and create cavities in their vicinities, halting the accretion of matter. This is known as an HII region. This feedback can also have an effect on the available mass the resulting black hole can accrete after its formation. This is because a large amount of gas will be expelled from the dark matter halo surrounding the star due to the expanding HII region and resulting supernova. Thus, in order to get a massive enough star requires that an HII region does not form, requiring that the star itself has a low enough surface temperature (i.e., the star does not emit a significant amount of ionizing radiation). Evolution of the stellar interior structure for a protostar accreting mass at a rate of 0.1 solar masses per year. In this article, the authors study the early evolution of protostars up to 1000 solar masses which are gaining mass at very high accretion rates – from 0.01-1 solar masses per year. The figure to the left shows the protostellar evolution for a star accreting at a rate of 0.1 solar masses per year. You can think of the mass axis (x-axis) also representing time since the star is accreting matter. The thick black line denotes the stellar surface, the dashed-dotted line shows the radial position where 70% of the stellar mass is enclosed, and the dotted lines show the radial position of certain mass coordinates (i.e., evolution of certain mass shells). The gray shaded area denotes where energy transport within the star is dominated by convection whereas the white area below the black line shows where radiation (i.e., photons) transports energy outwards. The hatched areas denote nuclear burning (e.g., deuterium and hydrogen burning). For comparison, the solid blue line shows the stellar surface of a protostar that is accreting mass at a rate of 0.001 solar masses per year, the typical accretion rate for the formation of Population III stars. 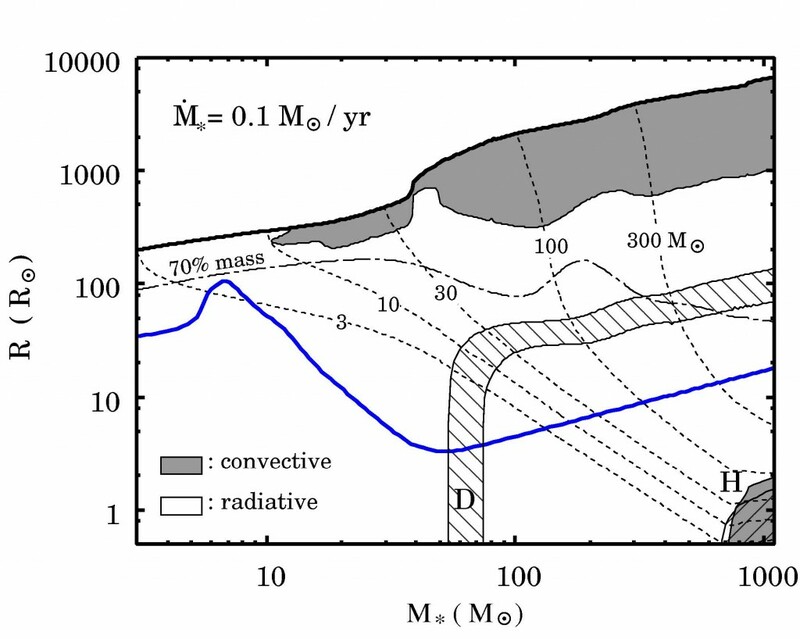 This figure clearly shows the effect the accretion rate has on the interior structure of the accreting protostar. The authors also model several other stars which are gaining mass at rates between 0.01-1 solar masses per year and find similar results. The authors find that when stars gain mass at accretion rates larger than ~0.01 solar masses per year they inflate to very large radii that grow monotonically with mass at least up to 1000 solar masses. When the mass exceeds ~100 solar masses, the star consists of a contracting radiative core and a bloated convective surface layer. Similar to a red giant, such a star would have a dense core and a puffy envelope. After a few tens of solar masses of material had fallen onto these fast-accreting super-massive stars, they have relatively constant surface temperatures, approximately 5000 K. Therefore, these stars would have not emitted enough ionizing radiation to halt accretion and expel gas from their surroundings. Furthermore, they find that the radii of these stars converge to ~7000 solar radii, as long as the accretion rate is larger than ~0.03 solar masses per year. For the lower accretion rates considered, the star’s core is more centrally concentrated and the puffiness of it’s envelope increases to achieve the same stellar radius at 1000 solar masses. The authors only run their models to 1000 solar masses due to numerical issues. However, if the stars continue this behavior until they reach ~100,000 solar masses, they could be potential progenitors of SMBHs in the early universe since they are large enough to leave behind massive black holes and also have little effect on their environment.